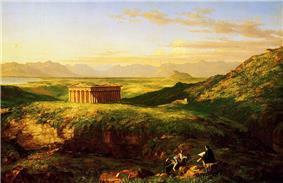 Thomas Cole (February 1, 1801 – February 11, 1848) was an American artist. He is regarded as the founder of the Hudson River School, an American art movement that flourished in the mid-19th century. 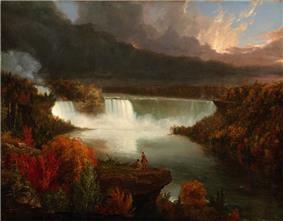 Cole's Hudson River School, as well as his own work, was known for its realistic and detailed portrayal of American landscape and wilderness, which feature themes of romanticism. He was born in Bolton, Lancashire, England, in 1801. 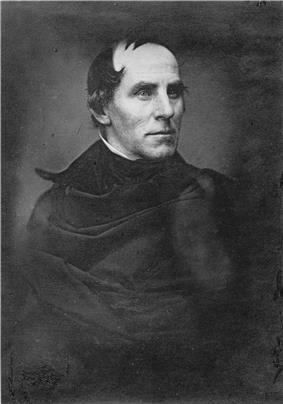 In 1818 his family emigrated to the United States, settling in Steubenville, Ohio, where Cole learned the rudiments of his profession from a wandering portrait painter named Stein. However, he had little success painting portraits, and his interest shifted to landscape. Moving to Pittsburgh in 1823 and then to Philadelphia in 1824, where he drew from casts at the Pennsylvania Academy of the Fine Arts, he rejoined his parents and sister in New York City early in 1825. In 1826, he helped found the National Academy of Design. The Titan's Goblet (1833). Oil on canvas; 49 × 41 cm. The Metropolitan Museum of Art, New York. In New York, Cole sold five paintings to George W. Bruen, who financed a summer trip to the Hudson Valley where the artist produced two Views of Coldspring, the Catskill Mountain House and painted famous Kaaterskill Falls and the ruins of Fort Putnam. Returning to New York, he displayed five landscapes in the window of William Colman's bookstore; according to the New York Evening Post Two Views of Coldspring were purchased by Mr. A. Seton, who lent them to the American Academy of the Fine Arts annual exhibition in 1826. This garnered Cole the attention of John Trumbull, Asher B. Durand, and William Dunlap. 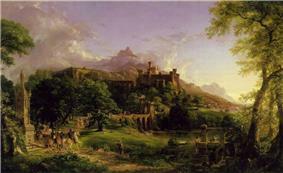 Among the paintings was a landscape called "View of Fort Ticonderoga from Gelyna". Trumbull was especially impressed with the work of the young artist and sought him out, bought one of his paintings, and put him into contact with a number of his wealthy friends including Robert Gilmor of Baltimore and Daniel Wadsworth of Hartford, who became important patrons of the artist. 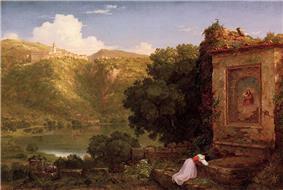 Cole was primarily a painter of landscapes, but he also painted allegorical works. The most famous of these are the five-part series, The Course of Empire, which depict the same landscape over generations—from a near state of nature to consummation of empire, and then decline and desolation—now in the collection of the New York Historical Society and the four-part The Voyage of Life. There are two versions of the latter, one at the National Gallery in Washington, D.C., the other at the Munson-Williams-Proctor Arts Institute in Utica, New York. 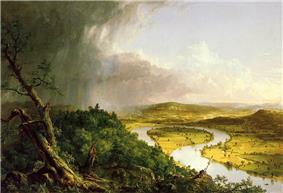 Among Cole's other famous works are the Oxbow (1836) (pictured below), the Notch of the White Mountains, Daniel Boone at His cabin at the Great Osage Lake, and Lake with Dead Trees (1825) which is at the Allen Memorial Art Museum. 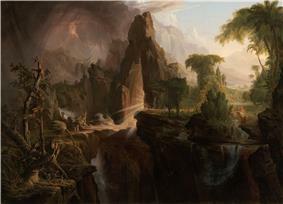 He also painted The Garden of Eden (1828), with lavish detail of Adam and Eve living amid waterfalls, vivid plants, and deer. In 2014, friezes painted by Cole on the walls of his home, but which had been decorated over, were discovered. 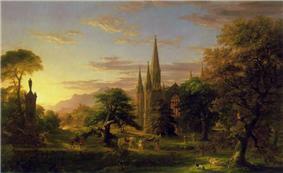 Cole influenced his artistic peers, especially Asher B. Durand and Frederic Edwin Church, who studied with Cole from 1844 to 1846. 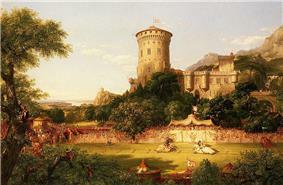 Cole spent the years 1829 to 1832 and 1841 to 1842 abroad, mainly in England and Italy. 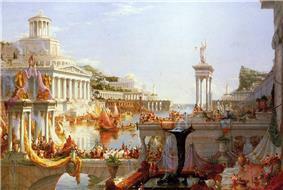 Thomas Cole is best known for his work as an American landscape artist. However, Cole also produced thousands of sketches of varying subject matter. Over 2,500 of these sketches can be seen at The Detroit Institute of Arts. 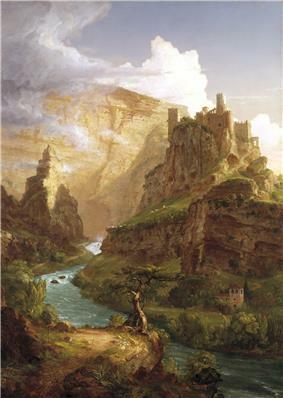 In 1842, Cole embarked on a Grand Tour of Europe in an effort to study in the style of the Old Masters and to paint its scenery. Most striking to Cole was Europe's tallest active volcano, Mount Etna (Regarding the title: "Etna" is the more common spelling in the present day, but "Aetna" was a common nineteenth-century variant). 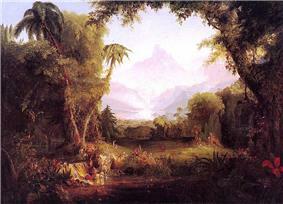 Cole was so moved by the volcano's beauty that he produced several sketches and at least six paintings of it. 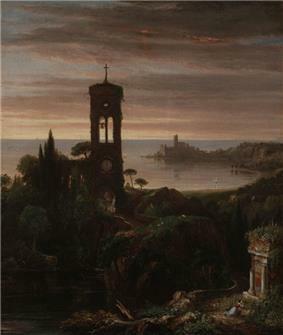 The most famous of these works is A View from Mount Etna from Taormina which is a 78 in. x 120 in. oil on canvas. Cole also produced a highly detailed sketch of it, entitled View of Mount Etna (pictured below) which shows a panoramic view of the volcano with the crumbling walls of the ancient Greek theatre of Taormina on the far right. 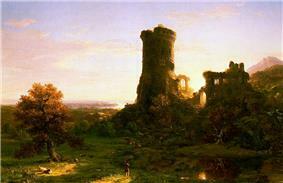 Thomas Cole, Jr., born September 16, 1848. Additionally, Thomas Cole held many friendships with important figures in the art world including Daniel Wadsworth whom he shared a close friendship with. Proof of this friendship can be seen in the letters that were unearthed in the 1980s by the Trinity College, Watkinson Library. 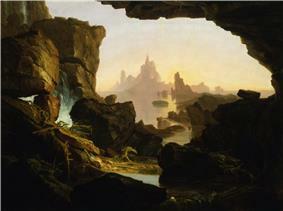 Cole emotionally wrote Wadsworth in July of 1832: "Years have passed away since I saw you & time & the world have undoubtedly wrought many changes in both of us; but the recollection of your friendship... have never faded in my mind & I look at those pleasures as "flowers that never will in other garden grow-" Thomas Cole died at Catskill on February 11, 1848. 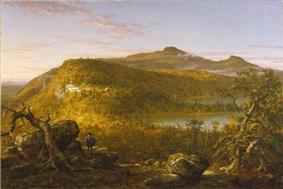 The fourth highest peak in the Catskills is named Thomas Cole Mountain in his honor. Cedar Grove, also known as the Thomas Cole House, was declared a National Historic Site in 1999 and is now open to the public. Cole dabbled in architecture, a not uncommon practice at the time when the profession was not so codified. Cole was an entrant in the design competition held in 1838 to create the Ohio Statehouse in Columbus, Ohio. His entry won third premium, and many contend that the finished building, a composite of the first-, second-, and third-place entries, bears a great similarity to Cole's entry. 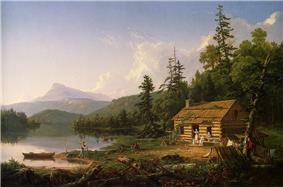 A View of the Two Lakes and Mountain House, Catskill Mountains, Morning (c. 1844). Brooklyn Museum. ^ Effmann, Elise (November 2004). 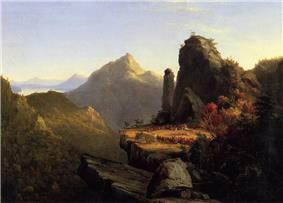 "Thomas Cole's View of Fort Putnam" (PDF). ^ "Property and Progress: Antebellum Landscape Art and Property Law" (PDF). Retrieved 2014-03-26. ^ Schweber, Nate (July 1, 2015). 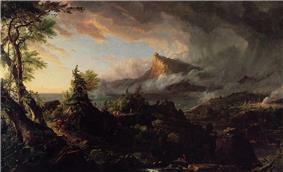 "Unknown Thomas Cole Paintings Found at His Home". nytimes.com. Retrieved July 3, 2015. 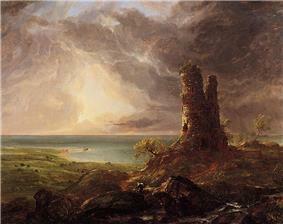 ^ "Studies on Thomas Cole" Baltimore Museum of Art, Annual II. pp. 123. Baltimore, Maryland 1967. 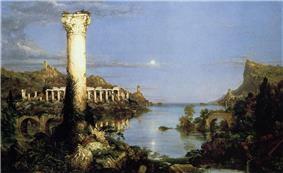 ^ "A Guide to the Thomas Cole Collection" (PDF). Albany Institute of History and Art. p. 9. Retrieved 2009-01-06. ^ Cole, T., & Wadsworth, D. (1983). The correspondence of Thomas Cole and Daniel Wadsworth: Letters in the Watkinson Library, Trinity College, Hartford, and in the New York State Library, Albany, New York. Hartford, Conn.: Connecticut Historical Society. ^ "Cedar Grove History". 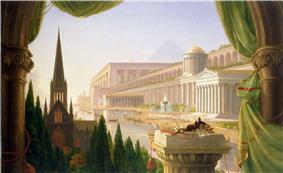 Thomascole.org. Retrieved 2014-03-26. ^ "History of Cedar Grove". The Thomas Cole National Historic Site. Retrieved 2007-10-30. Information about Thomas Cole can be found in the Thomas Cole Collection, which contains correspondence, financial and legal documents, clippings, exhibition catalogs, poems related to him and his family, in the Albany Institute of History & Art Library. Thomas A. Cole Papers, 1821–1863. This finding aid contains biographical information about Cole and describes the collection of his papers (correspondence, journals, notebooks, essays and poetry) held by the New York State Library. Thomas Cole's Journal, 1834–1848. The journal, which was digitized by the New York State Library, contains scattered handwritten entries from November 5, 1834, through February 1, 1848.